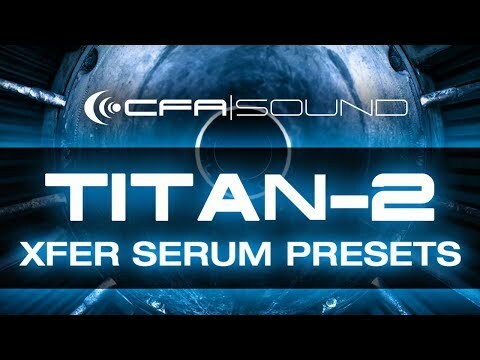 Boost your EDM music to the next level with the brandnew CFA-Sound TITAN-2 Xfer Serum Presets – a powerful arsenal featuring 90 superb presets containing bouncing basses, massive lead sounds, spacious pads, lush plucks, driving synth and fx sounds. All presets offer full Macro Control allocation for maximum flexibility and instant inspiration. Tags: Deep House, EDM, Electro House, Glitch Hop, Hard Dance, House, Progressive House, Trance, Xfer Serum Presets. Boost your EDM music to the next level with the brandnew CFA-Sound TITAN-2 Xfer Serum Presets – the long awaited sucessor of our first soundset for Xfer Record`s mighty Serum synthesizer. With it`s incredible sound qualityhighly flexible sound engine and workflow, Serum is a the must-have synthesizer for every EDM producer – together with these brandnew Serum presets this soundset gives you a powerful arsenal featuring 90 superb presets containing bouncing basses, massive lead sounds, spacious pads, lush plucks, driving synth and fx sounds. All presets offer full Macro Control allocation for maximum flexibility and instant inspiration. Inspired by Martin Garrix, Hardwell, Eric Prydz, KSHMR, Headhunterz, Quintino, MOTI and other leading EDM artist – all presets are designed to fit right away in your mix from EDM, Big Room, Electro & Future House, Trance up to Rawstyle and other related genres. A true must-have for every EDM musicians with Serum in his DAW! 20 Bass, 6 FXs, 19 Lead, 10 Pad, 13 Pluck and 22 Synth sounds. Note: Drums, FX & Vocal sounds of the demo track are not included in this soundset and are for illustration only.